MIRAMAR, Florida (March 28, 2019) — Filipino seafarers working far from home can soon catch their favorite Kapuso programs while at sea as GMA Network’s flagship international channel GMA Pinoy TV has become the first Philippine network available for broadcast onboard via CRUISESAT from Digital Video Systems. DVS’s premier service features top-tier, high-definition television content for the cruise, yacht and cargo industries. The partnership, signed in Miami Jan. 21, 2019, by GMA International, the Philippines’ most popular TV network, and Digital Video Systems, a maritime systems integration and telecommunications provider, grants rights to distribute Kapuso programs to DVS for the cruise industry worldwide. Viewers from across the globe can catch their favorite Kapuso shows via GMA’s international channels GMA Pinoy TV, GMA Life TV and GMA News TV International. For more updates, visit www.gmapinoytv.com. CRUISESAT launched in June 2017 and was developed to deliver high-definition news, entertainment, sports and cultural networks to the maritime market using single-antenna systems for all video content including linear television channels and nonlinear video content, multicultural programming, audio content and branded networks. CRUISESAT has already broadcast over 300 live special events, totaling 1,000-plus hours of major sporting events. For more information, visit www.digitalvideosystems.net. GMA Pinoy TV is a Filipino television channel incorporated in February 2004 by GMA Network and its subsidiaries, GMA International and GMA Worldwide Inc. It was launched in 2005, primarily in Japan and the USA, as a 24-hour international Filipino television station. The channel is targeted to overseas Filipinos and their families in the Philippines. Drawing on programming from its flagship station in the Philippines, GMA Network’s programs can be seen worldwide. DVS has been a leading provider of maritime and land-based telecommunications, managed services and systems integration using state-of-the-art technology for 40 years. DVS has leveraged its knowledge of telecommunications technology and video systems integration to create CRUISESAT (www.cruisesat.com), the premier satellite direct-to-ship and vessel entertainment television service platform that delivers popular high-definition and standard-definition news, entertainment, sports and cultural networks to the maritime market in the Caribbean, United States, and Canada. For more information, visit www.digitalvideosystems.net. MIRAMAR, Florida (Feb. 7, 2019) — Maritime Mobile Communications LLC (doing business as Digital Video Systems) has installed the CRUISESAT satellite direct-to-ship and vessel entertainment service on 28 cruise ships currently sailing in the Americas. Digital Video System’s premier service features top-tier, high-definition television content for the cruise, yacht and cargo industries. CRUISESAT can provide cruise guests and crew members an expansive lineup that includes the most popular sports, entertainment and news channels aboard ships sailing in the Caribbean, United States and Canada regions. The CRUISESAT service leverages Digital Video System’s media gateways in Florida and New Jersey, which operate more than 25 transmit and receive satellite antennas and fiber links to and from the Americas. CRUISESAT, which launched in June 2017, was developed to deliver high-definition news, entertainment, sports and cultural networks to the maritime market using single-antenna systems for all video content including linear television channels and nonlinear video content, multicultural programming, audio content and branded networks. CRUISESAT has already broadcast over 300 live special events, totaling 1,000-plus hours of major sporting events. It was another great year at Seatrade Global in Fort Lauderdale for Digital Video Systems. With the rapid growth of the cruise industry, new opportunities and partnerships are abundant and promising. This year, Digital Video Systems’ Owner and President, Chuck Sackermann, was invited to moderate a panel titled “Cruise Connectivity: Planning today for the ships of tomorrow”. The discussion focused on the continuous developments in technology and how cruise lines and vendors today are planning to meet the standards of tomorrow. Gone are the days of taking a cruise so you can disconnect! Today almost everyone wants to be connected no matter where they are in the world. So the big question at hand was how to deliver an outstanding product for the ever growing demands of the cruise ship guests when it comes to cruise connectivity at sea. 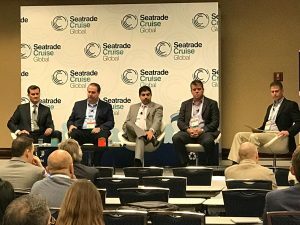 Learn more through the article from Seatrade Insider. 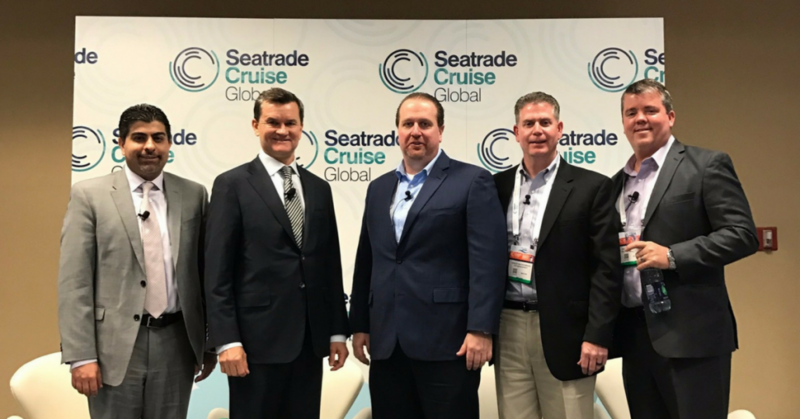 Chuck Sackermann, the President and Owner of CSC Management & Digital Video Systems was invited to moderate a technical panel for the 2017 Seatrade Global Cruise Conference. The discussion focused on the lagging technology currently available in the cruise industry for connectivity. Panelist described the task to improve “transformational” and “monumental”. Chuck Sackermann, Digital Video Systems’stated, “While cruise lines and service providers have tried to meet consumer’s needs, the target is ever changing. We are proud of what we do and the kind of growth we have managed to achieve, but there is much more to be done. Technology never stops and we too are looking to make continuous inroads for further progress.” The kind of new opportunities and growth which the cruise industry offers is enormous and encouraging. Cost has been an impediment to the cruise industry as the bandwidth needed to drive superior service levels came with a large price tag. “We are optimistic that in near future, cruise ship guests will be able to appreciate the same level of communication services as enjoyed at home,” says Chuck. It is important to make the most of the technology so that people can benefit at large. The big question during this discussion was how to deliver an outstanding product and serve the growing needs of the cruise ship guests when they are at sea. For more detail on the discussion, go to: http://digitalvideosystems.net/news/cruise-connectivity/. CSC/DVS is a 40-year-old infrastructure communications company that specializes in maritime VSAT and audiovisual integration services as well. They have managed more than 250 vessels at the sea and have tremendous experience and expertise in their field. With the rise of Spotify and online radio, many people may think that the FM radio will die out soon. How true is this claim? Well, it is right to an extent. Do you remember a time when the only source of radio was your FM receiver in your car or your big clunky stereo system in your living room? Today, a lot of people prefer to use their phones to listen to radio online. Is the future of FM radio in jeopardy? Maybe well into the future, but it seems to currently have a tenacious hold on our hearts and minds. According to the “State of the News Media” report for 2015 put out by the Pew Research Center, FM radio still reaches about 91 percent of the population every week. Actually, this number has stayed the same since the early 2000s. This might come as a surprise to many millennials who tend to favor online radio and Spotify. According to the same report, over half of the population 12 years old and over listen to online radio at least once in a week. 2015 was the first year that online radio broke the 50 percent mark, so this shows that online listening is definitely on the rise. But when we sit in our cars, people still seem to turn on the traditional radio every once in a while. Maybe this is a force of habit or a subconscious routine. On another note, many people see their traditional radios as a backup to their online listening and vise versa. This will probably be the main reason why FM radio will stick around longer than people might expect it to. FM stations provide excellent local news with local talent that gives insight into everything from sport, news and weather to local politics. Also, FM radio stations and shows tend to have this unique feel to them that make it almost surreal to listen to. Some people may just enjoy this feeling and wish to hold onto it for as long as possible. This nostalgic feeling is the same reason why people still enjoy vinyl. It seems that our old school radios will stick around for a little while longer while its sibling, the online radio, grows up with the younger generation. The Internet while getting more reliable is not proven, as it is based on best effort technology, and it does not have the built in redundancies and time proven reliability of traditional FM radio stations. FM radio was born in 1928 out of research and development as a way to successfully improve AM radio by eliminating static. 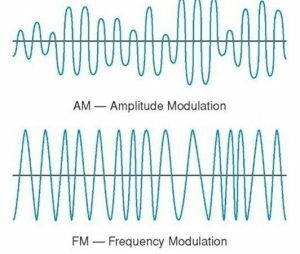 With an entirely new approach to transmitting radio signals, the late Major Edwin Armstrong invented a method of producing high fidelity sound using Frequency Modulation “FM”. (One of several key inventions this little known inventor gave to our society namely, “Wireless Receiving System”, “Electric Wave Transmission”, “Antenna with Distributed Positive Resistance”, “Method of Receiving High Frequency Oscillation”, “Selectively Opposing Impedance to Received Electrical Oscillations”, “Signaling System”, “Wireless Receiving System for Continuous Wave”, “Radio Signaling System”) Unfortunately this superior technology was not embraced by the communication industry largely because of corporate greed. 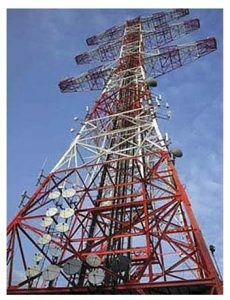 Many established broadcasters felt FM was a threat and did what they could to dismiss or delay its public acceptance. Mr. Armstrong was forced to use his own money to build the first commercial FM Radio station, W2XMN and later KE2XCC, in 1937 in Alpine, NJ. http://www.cscmgt.net/history.php The effects of the Great Depression and start of World War II also diverted resources from the development process. Various household appliances often caused static interference to AM radio. AM radio also experienced interference at night and had a limited audio quality. By the mid-1940s many radio stations were simulating AM and FM versions of their stations, as many radio owners didn’t want the hassle of buying a high fidelity radio after recently purchasing a new AM radio. The FCC would take away rights for stations to simulcast many years later. In terms of FM radio becoming a preferred standard; it would be approximately 50 years before the number of FM stations would overtake commercial AM radio stations in the year 1990. Today FM still stands as the favored commercial radio source. FM Radio continues to progress in its metamorphosis as we watch the advent of the FCC’s remanding policies and the conversion to a digital world. DVS joined almost 900 exhibiting companies, 142 of which were first time exhibitors, as they showcased their new products, services and exciting cruise destinations at the Miami Beach Convention Center from March 10-13, 2014 to celebrate the Seatrade Cruise Shipping Miami 30th Anniversary Show. For nearly 30 years, Cruise Shipping Miami has been the cruise industry’s premier global event, bringing together buyers and suppliers for a week of networking, sourcing and education. From a small gathering of 150 cruise industry executives in a New York City hotel meeting room in 1985, Cruise Shipping Miami has grown into a four-day conference and three-day exhibition. This year’s show had nearly 12,000 attendees, a 10% increase over the 2013 show, coming from 127 countries. During the Keynote address, top executives from the major Cruise Lines gave valuable insight into the State of the Global Cruise Industry. They all discussed the potential growth in different markets around the world. Cruise Ship Miami furnished DVS with a networking forum allowing DVS to exhibit at their booth a Hybrid Wi-Fi solution and exciting new content for delivery to the vessels. “This is our5th year exhibiting at the show and we plan to continue to be represented. The show affords us the opportunity to network with current and new customers presenting our newest products and services as well as discussing future business,” said Jorge J. Necuze, DVS VP of Sales. Although this year’s Info Comm hosted by the Las Vegas Convention Center promised to be larger with plenty of new technology, in my opinion it did not live up to its billing overall. Most of the manufacturers dealing with the visual side were pushing 4K as they should, pictures are gorgeous but the issue is still lack of content although it’s improving. There are a lot of movies in the past 2 years that were done in 4K but won’t come out commercially into the home until the sales of the 4K panels improve. There was a lot of buzz at Info Comm concerning Video Conferencing with some low end solutions as well as some very high end. Cloud based and 4K resolutions were the key points. Of course a VC system using 4K requires much more bandwidth so providers are salivating. Companies like Samsung, Sony, Planar and LG showed some very impressive 4K panels and size seems to be increasing every 6 months. Crestron, AMX and others were also touting 4K products. AMX: Introduced new Modero X G5 panels that looked very nice and offer more power, functionality and speed. An IP Video Conferencing camera named Sereno with 1080P resolution @ 30fps, offers an ultra wide field of view to make sure all of the participants are seen and a swivel base to aid in capturing the view regardless of room layout or display location. However, the best I saw is a product called Enzo, which even though it came out last year, won this year’s best Commercial Integration award. Enzo is a content sharing platform designed for meeting rooms, classrooms and other collaboration spaces providing instant access to a wide variety of content and web conferencing services. By adding the Sereno camera to this product, it becomes a very affordable video conferencing system without the need for a PC or other expensive devices. PANASONIC: Introduced several new displays, projectors, pan & tilt cameras and camera controls. The one product they introduced which is amazing is the ET-D75LE90 Ultra Short Throw lens. This is the world’s first lens for high brightness 3 chip DLP projectors featuring the world’s shortest throw. The lens is able to project a screen size between 10 to 50 feet, while being inches away from the screen (depending on screen size). This lens reduces projection to screen distance by 60% for more effective space utilization. BLACKMAGIC: Introduced Blackmagic URSA, designed for feature film, television commercials and more! This is a 4K ultra resolution camcorder with a Super 35 image sensor for $5,995.00 LIST! It’s an unbelievable price for this type of quality camera. If you don’t need a Super 35 sensor and are satisfied with just shooting 4K video, the price drops to $4,495.00…. AJA: Introduced CION, a 4K camcorder also with a Super 35 sensor to enable film recording. CION uses AJA’s proven SSD based pack storage mounted directly in the camera. List price is also $5,995.00 and comes with a 2 year warranty. MULTITACTION: Introduced iWall a very impressive product targeted to public spaces like corporate lobbies, city hot spots, sales offices, visitor centers, etc. iWall includes a customized Multitaction experience app. It is a scalable multi-user application designed to present a wide range of rich media content in a playful way. Mini-apps are also available to provide additional functionality such as social media integration. It also includes Codice, a user identification as well as IR pen input to engage with users in new ways. Visit this link to see more. This was the most impressive product I saw at the show. JBL: Introduced the new EON600, a new product developed to provide the best sound possible regardless of the application. It’s available in 10, 12 and 15inch models. Visit this link to see more. Although this year’s show hosted by the Las Vegas Convention Center promised to be larger with plenty of new technology, in my opinion it did not live up to its billing overall. Most of the manufacturers dealing with the visual side were pushing 4K as they should, pictures are gorgeous but the issue is still lack of content although it’s improving. There are a lot of movies in the past 2 years that were done in 4K but won’t come out commercially into the home until the sales of the 4K panels improve.